Arab Spring : The Two-Way Early Friday, Islamists approved a draft that critics are calling the "Muslim Brotherhood constitution." Protesters are also rallying against President Mohammed Morsi's decree giving him sweeping new powers. 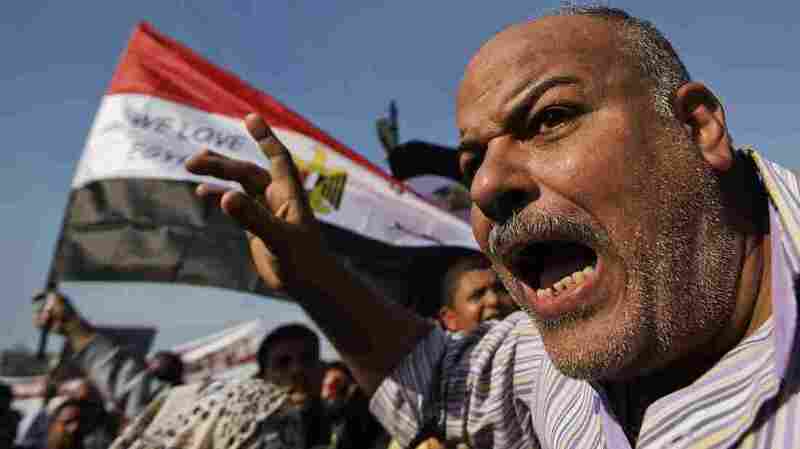 A protester shouts early Friday in Cairo's Tahrir Square. Protesters have streamed into Cairo's Tahrir Square again today, correspondent Merrit Kennedy tells our Newscast Desk. She says they're there both to demonstrate again against President Mohammed Morsi's decree giving himself sweeping new powers and to express concern about a draft constitution passed early today by Egypt's constitutional assembly. As The Associated Press reports, Islamists approved the draft "without the participation of liberal and Christian members, seeking to pre-empt a court ruling that could dissolve their panel with a rushed, marathon vote that further inflames the clash between the opposition and President Mohammed Morsi." "The move advanced a charter with an Islamist bent that rights experts say could give Muslim clerics oversight over legislation and bring restrictions on freedom of speech, women's rights and other liberties. The draft must now be put to a nationwide referendum within 30 days. Morsi said Thursday it will be held 'soon.' "
" 'People have already gathered here to join the thousands gathered in a sit-in for much of the past week,' she reported. 'They're here to protest against the recent decrees of the president, but also now against this draft constitution passed last night by the constituent assembly.' "
"Critics say it's not just that the president is rushing through an imperfect document, but one that could be dangerous. For instance, the draft constitution has preserved broad powers for the president although it does stipulate four-year term limits. There is still little civilian oversight of the military. And perhaps the most controversial part is the slightly expanded role and influence of Islam, which gives clerics a consulting role on legislation. "For all the hope of change, observers say the document is quite similar to the 1971 constitution it's expected to replace."